This Buddha bowl was delicious and super easy - I was after something quick (little bit hungover - needed sustenance ASAP) and I had some things in my fridge that needed used. 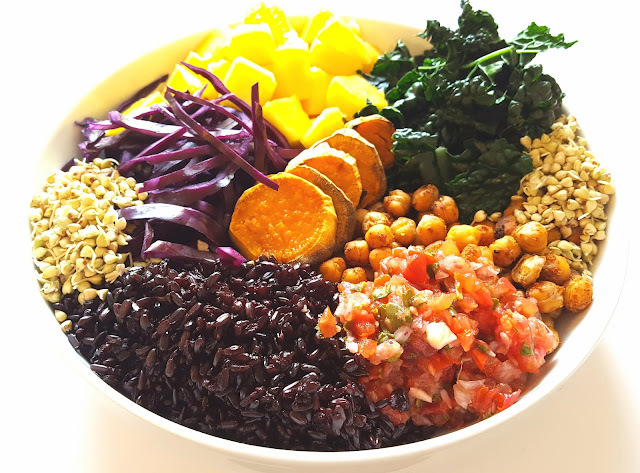 Buddha bowls can be adapted in many ways, but as a general rule I try to include some sort of healthy grain, greens, legumes/beans and whatever else I want/need to use just gets chucked in! P.S. I said I would report back on the fermented salsa! I've been using it for about a week now and I'm hooked. It's so much more flavoursome than 'normal' salsa. I've been using it with salads, sweet potatoes, tortilla chips (bold!) and everything else in between. For a recipe that was so simple (chop everything and chuck in a mason jar with some pink salt) this was insanely good..! I will continue to make this regularly because it's a great option to have in the fridge - thumbs up!